Situated 2 blocks from Fairmont Towers, Jefferson Apartments is a 69 unit mid-rise that offers a quaint living experience for those who wishes live in smaller community with all the convenience of downtown living. 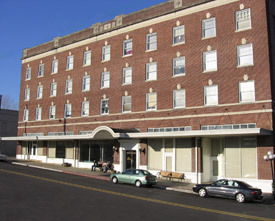 Formerly known as the historic Jefferson Hotel, the Jefferson Apartments offers efficiencies, one and two bedroom apartments. Amenities include all utilities paid by management, on-site laundry facilities, 24 hour controlled access, friendly staff and all the convenience of downtown living.